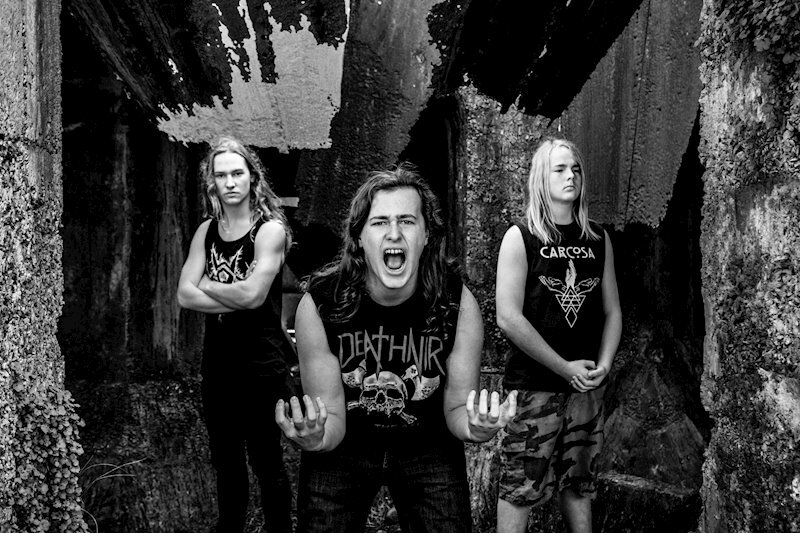 Teenage thrash metal band Alien Weaponry are New Zealand’s rising musical stars. With a career that started when the band members were just 10 and 12 years old, they supported hard rock icons Devilskin when they were 12 and 14, opened for the legendary SHIHAD a year later, and in 2016 took the top prize in two of the country’s major music competitions – Smokefreerockquest and Smokefree Pacifica Beats. In September 2017, they won the prestigious APRA Maioha award for their song ‘Raupatu’ – a thrash metal commentary on the 1863 act of parliament that allowed the colonial government to confiscate vast areas of land from the indigenous Māori people. On 16 November, they took their places among NZ’s musical elite as nominees at the Vodafone New Zealand Music Awards. The trio shock and surprise audiences on a number of levels. Their songwriting is complex, developed and highly political. Their live performance energy is startling, with just two fifteen-year olds commanding the front of stage as effectively as four- and five-piece bands three times their age. But perhaps most surprising of all, given their blonde flailing locks and Viking appearance, many of their songs are in New Zealand’s native language, Te Reo Māori. In fact, guitarist/lead singer Lewis de Jong (15) and his brother, drummer Henry (17), are of Ngati Pikiāo and Ngati Raukawa descent – they call themselves ‘Stealth Māori.’ They attended a full immersion kura kaupapa Māori (Māori language school) until they were seven years old, where singing waiata and performing haka were a daily routine. Also ingrained in their early learning were stories of New Zealand history from a Māori perspective –giving rise to songs like ‘Raupatu’, ‘Urutaa’ (about an early Māori -European contact incident which resulted in an outbreak of sickness; and the subsequent revenge – the burning of the ship The Boyd and the massacre of its crew); and ‘Rū Ana te Whenua’ (which tells the story of the mighty battle at Pukehinahina/Gate Pa in 1864 where their ancestor, Te Ahoaho, lost his life). The combination of thrash metal with Māori history and language has proved popular. In the six weeks since its release, the video for Rū Ana Te Whenua had ¾ of a million Facebook views, spent 2 weeks at no. 1 on Spotify’s NZ Viral chart, and hit no. 2 on the iTunes global metal chart (just behind Iron Maiden’s ‘Run to the Hills’). The band’s music has been playlisted on stations in New Zealand and around the world – from Scotland to Brazil, as well as the USA, Australia and Germany. Their first overseas performances will be in Sydney and Melbourne, Australia in December 2017, and they recently signed a 3-year contract with German management agency Das Maschine, who will be bringing them to Europe in 2018 for a swag of high-profile summer festival performances. The band’s English material is equally controversial, with songs like ‘Hypocrite,’ ‘Rage,’ ‘PC Bro’,’ and ‘The Cult of Sanitised Warfare’ calling out everyone from teachers and friends at school to the media for variously glorifying and destroying the lives of television and sports stars. “It also works with Te Reo Māori,” adds Henry. “Both the musical style and the messages have a lot of similarities with haka, which is often brutal, angry and about stories of great courage or loss.” Other early musical influences included Red Hot Chilli Peppers, Rage Against the Machine and Metallica; and the brothers wrote their first song together when they were 8 and 10 years old. The band’s name was also decided then – inspired by the movie District 9. Bass player Ethan Trembath (15) and guitarist Lewis met while honing their unicycling skills at the local circus school in Waipu, Northland, where the de Jong brothers moved to in 2012. He scored the job in Alien Weaponry because he could play the ukulele and (at age 10) he was the first one of their friends who could reach the end of the bass guitar. The prestigious UK based Metal Hammer magazine included the trio in its ‘Ten Best Metal Bands from New Zealand’ lineup in Oct 2016, describing them as “One for the future,” and in August 2017 followed up with a full feature on the band. And it’s not just the metal community who are taking notice. London-based youth culture and fashion institution i-D ran a piece on the band in September 2017. More recently, Alien Weaponry featured in a story entitled ‘Can a Thrash Metal Band help save the Maori Language?’ published in the respected New York political and cultural journal, The Atlantic. In New Zealand, they have appeared on everything from Kids’ TV shows Pukana! and Sticky TV to late night political comedy panel 7 Days. “They believe in their identity as a metal band, their use of Te Reo is impressive, there’s really nothing else like this in the world at the moment,” agrees Jeff Newton from NZ On Air.